I may be (half) joking sometime, but it happens to be serious too: encountered an old laptop (in bad shape, lot of dead pixels and such, it was a workhorse back in its time) which refuses to play along with Windows: bluescreen at startup, bluescreen at fresh install, hardware problems. The first thought: memory problems but memtest96 running from a Fedora live CD disagrees... but if I booted the device from that CD, just for the kicks I booted the distro (F14): works correctly, no lock-up, even WiFi is supported OOTB (so I suspect the hardware problem lies with the video card and is triggered by real use, not by the VESA driver). The laptop won't go for repair, so I have to do something... then I was struck: if Linux seems to work on it, let me put Linux as a full install: is going to be used a few days until the main laptop returns from the repair shop and then occasionally by a kindergarden kid (rarely and under his mother's supervision). Then... which flavor? At first I wanted a recent Fedora (F16) with Xfce but then it struck me: there is something better for the task, CentOS 6.2 with a full GNOME install, a sane desktop, working close of what they know and expect and relatively recent software (they don't need bleeding edge stuff like me). A friend of mine asked: why not Sugar? and my only reply was "hahaha!" those people already used computers, they expect a panel, a Firefox icon, file icons, multiple windows... something that won't look alien. And even the kid will use it with the mother next to him, and she needs to understand it. So the CentOS install went smoothly, starting from a live image, installed it to the hard drive, updating the software (you can get even Firefox 10, so is quite new) and then completing the install with some multimedia packages (repoforge filled the bill for this) and a bit of customization of the layout, to be more Windows-like. 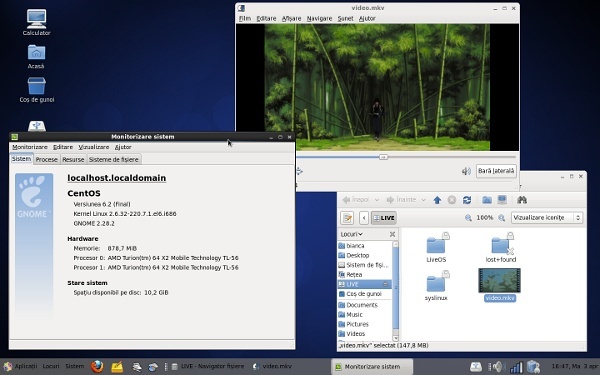 As a conclusion, CentOS is a good option if you want a solid, classic desktop that works the way you are used with. The packages are (yet) relatively recent and will stay the same for the life of the current Fedora release, so you don't lose much. The looks of the distro are somewhat split: while the boot animation is beautiful, when you get to the desktop, there are still some Bluecurve icons (for LibreOffice). I would use that for myself? no. I would recommend it for others? yes. I did the same at home for my main workstation. CentOS 6 is a very viable option to remain productive. When I chose a distribution for my workstation I considered a Red Hat clone and Debian. Finally, I chose Debian. I think it is as stable as the others, however its repository is way much larger. But CentOS is a decent distro. Good choice. There is no problem with the repo size of CentOS until you hit the multimedia stack, and there I found a good solution is Repoforge (Rpmfusion + EPEL were useless, the Rpmfusion repo for EL is *empty*, unlike the repo for Fedora, which is what I use all the time). There is also a slight problem with package versions, for example while Firefox is decently at version 10 (from the main repo), VLC is only 1.1 (from Repoforge).